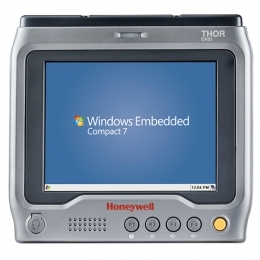 The powerful Honeywell CV31 mini terminal is specially laid out for vehicle mounting. Its compact design simplifies mounting into any desired location - as a forklift terminal directly in the vehicle, or permanently installed for device management applications. Operate the computer easily via its 6.5 industrial touch screen with bright LED backlighting and frontal function keys. Bluetooth for wireless connection to scanners, etc. Thanks to the integrated UPS backup battery, you bridge power supply failures up to 30 minutes. This reduces waiting times for logging off and connection establishment during shift changes or even entire production failures to a minimum. Optionally receive the CV31 with an integrated display heater for use in cold storage down to -30 C. Via the integrated Ethernet port and Wi-Fi module 802.11 a/b/g/n the CV31 is fully networkable. Users also control peripherals, such as barcode scanners, wirelessly via Bluetooth. The robust housing features IP66 certification for excellent protection against water jets and dust it is also optimally protected against vibration and shocks in accordance with MIL-STD-810G.